"The first civil rights march was a major cornerstone in Irish history, the people of the north stood up and said no more will we be treated as second class citizens, shaping politics on the island of Ireland for decades." Today, 24th August, marks the 50th anniversary of the first Civil Rights march from Coalisland to Dungannon in County Tyrone. The Brantry Republican Club, led by Annie Mary Gildernew, had campaigned against the lack of council housing in the area. An Phoblacht spoke exclusively to Colm Gildernew, Sinn Féin MLA for Fermanagh and South Tyrone and grandson of Annie Mary or better known as ‘Nana’ Gildernew, about the first civil rights march and events leading to it. “Fifty years ago, on the 12th of October 1967, Dungannon District Council convened its monthly meeting. “One of the decisions they were about to take would reverberate across decades and bring the northern Unionist state to its knees and, some argue, ultimately led to its demise as a one party Orange state. “The Brantry Sinn Fein Republican Club, under the leadership of Annie Mary Gildernew (my Grandmother) had been trying to secure housing in the local area for nationalist families. “Dungannon Council refused point blank to build social housing in the Brantry area as this would also provide local nationalists with votes as well as housing. “Instead they agreed to build 15 houses in the then predominantly unionist village of Caledon and stated they would allocate these homes on the basis of half to unionists and half to nationalist families to ease the housing crisis. “At the council meeting this deal was reneged upon; Unionist Councillor William Scott simply presented a list of 15 names which he had decided would be housed, no debate, no discussion, no democracy. “The Brantry Republican Club met immediately to assess their next move. It was decided that they were left with no alternative but to take immediate and direct action. “At 2am, on Friday the 13th of October members of the Gildernew, Goodfellow and McKenna families supported by the Brantry Republican club went to Caledon and took possession of two of the newly allocated homes, (numbers 9 and 11 Kinnard Park, Caledon) including a three bedroom house which had been allocated to a single 19-year-old woman who worked for a Unionist election candidate. “In May 1968, following a 6 month series of court action and coercion, the State’s patience gave way; a force of policemen, led by the brother of the young single girl who had been allocated the house, evicted Nana Gildernew, her daughter Mary Theresa Goodfellow with a three-month old baby and two other small children, and her daughter in law Geraldine Gildernew, expecting me at the time and with two young children. They were forcibly dragged from the house under the gaze of the world’s press. “This led to the organisation of the first Civil Rights March from Coalisland to Dungannon was 24th of August to protest the eviction. 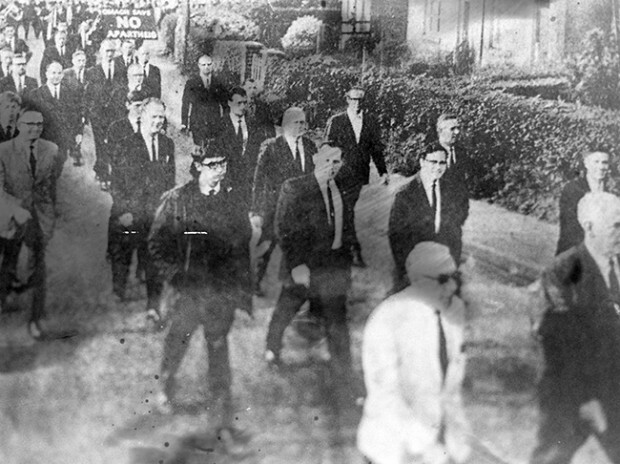 The march was blocked by the RUC at Thomas Street from entering Dungannon’s Market Square, subsequently leading to the second Civil Rights march in Derry’s Duke Street on 5th October 1968. "The first civil rights march was a major cornerstone in Irish history, the people of the north stood up and said no more will we be treated as second class citizens, shaping politics on the island of Ireland for decades," he said. Over 2,500 took part in the first civil rights march from Coalisland to Dungannon. The march was stopped short of Market Square by an RUC cordon. This would evidently change politics here forever - this was very much a campaign organised by people, from all backgrounds and none. Prominent republicans were also central to the organisation of demonstrations, including the now Mid Ulster MP, Francie Molloy and the late Stan Corrigan. Reflecting on the first civil rights march, 50 years on, Colm Gildernew said the first civil rights march should act as a rallying cry to those of us who seek to promote rights, equality and respect for all in society today. "We are currently experiencing an unacceptable blockade on a swathe of rights-based issues by the DUP, including Irish language, marriage equality, women’s health, and legacy rights. "There are huge concerns arising from Brexit and the recent Boundary Commission proposals, seen by many as a new attempt to gerrymander the north. This could have a chilling impact on rights and representation in the six counties," he concluded.